“Bhí na treoracha an-soiléir. Is bogearra thar a bheith aisiúil é” (Trans. “The instructions were very clear. It’s a very useful piece of software”). The above feedback reflects the breadth of Clilstore’s appeal and validates the Tools project’s intensive programme of dissemination and training. The suggestions for improvements also give us food for thought e.g. the user interface has been a matter of intense discussion among the Tools partners and plans are in place to address this issue within the coming year, however, new users will expect to see the promised improvements being delivered and the project teams will need to ensure that new users stay onboard as the improvements are carried out. While it is intended that new users who have benefitted from a Tools workshop will be able to use Clilstore confidently, and while new users are encouraged to contact us if they require any further assistance, follow-up meetings or repeat workshops for key user groups may be necessary or desirable in order to ensure that the service has been fully adopted and exploited. Island Voices on Clilstore – and on Facebook! Scotland’s Gaelic College, Sabhal Mòr Ostaig, plays an important role in the TOOLS project as it’s where the principal software programmer, Dr Caoimhìn Ò Donnaìle, is based. Caoimhìn teaches a number of modules for full-time students at the college, but alongside his teaching commitment he has a crucial responsibility for developing the Clilstore platform in response to feedback and demands from project partners and other users. The college is not new to co-operation with European partners. Indeed, another of its success stories, the award-winning bilingual “Island Voices/Guthan nan Eilean” project was first started as part of the 2005-2007 POOLS project. Following POOLS it took on a life of its own, expanding its stock of online video clips for language learners more than three-fold to an impressive total of over 150. Caoimhìn has now transferred all 150 clips (75 English and 75 Gaelic) onto Clilstore, which means that you can watch any video while accessing a transcript on the same page which will link any word you care to select to an online dictionary of your choice. A “unit info” button will give you additional summary information, such as a description of the contents, and notes about the language used, as well as a Short URL for posting as a link elsewhere, for example in your blog or on Twitter or Facebook. The Island Voices project continues to grow, though the focus has moved away from staff-produced videos to wider community engagement in the production of user-generated content in both audio and video formats, as well as written texts. This involves a lot of grassroots dissemination work in the Hebrides through all available means – including Facebook! A newly created Facebook page, at http://www.facebook.com/GuthanVoices, is proving useful in spreading the message, with a fast-growing number of “likes” from people (all over the world!) who want to follow the progress of the project. As the project develops its crowd-sourcing approach to “language capture” we can look forward to more and more authentic community-based materials finding their way onto the growing Clilstore archive! 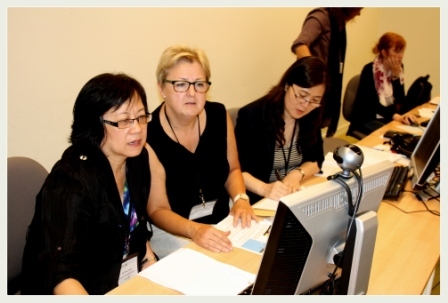 In August 2012 Tools project team had a wonderful opportunity to present the fruit of their work to the international community of language teaching professionals. This happened in an annual conference of EUROCALL which this year took place in University of Gothenburg (Sweden). It has been initially decided in the Tools work plan that some of the team meetings will coincide with EUROCALL conferences. This way we will not only reach a huge number of the end users, but will have a good chance to collect their feedback in order to develop and improve our tool- the Clilstore, and make the possibility to use it as easy as possible. What else can be more pleasant to the heart of a language teaching professional than getting to know colleagues with the same passion for CALL? The tools team was delighted to see more than 30 delegates to have registered for the workshop, which was due on the first day, which according to the framework of the Eurocall conferences, is usually dedicated to workshops. No matter how modest we would try to look, we must admit that the workshop was a success! Language teaching/CALL professionals from many European countries as well as from China, Chile, USA, Canada, Japan and others were attending the trainings for clilstore tool. At the same time members of Tools team interviewed the conference delegates during the breaks between sessions and presented the clilstore for additional 100 or more language teachers. Their opinion and feedback is very important to us. Many expressed their wish to continue testing and using the tool and we will contact them at the next phase of the project. It was amazing to observe the numbers of teaching units in Clilstore grow with every day of the conference! On the last day of the event Kent, our coordinator, invited Philip Hubbard, well known language teaching professor from the University of Stanford (USA) to participate in Tools project meeting and to share his ideas about computer assisted language learning methods he uses with his students as well as to comment on Clilstore tool. It was a pleasure to receive positive comments about the tool from Prof. Hubbard and to hear his intention to use the tool in the future. The Tools project team is glad to see the Clilstore family growing all over the world. 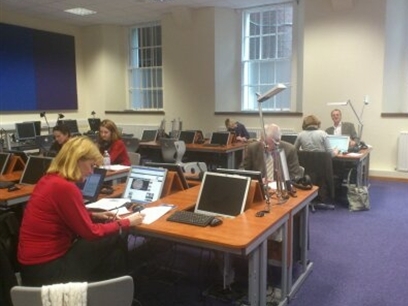 You are currently browsing the tools4clil blog archives for September, 2012.